A visit to Manzanita should always include a walk on the beach, which stretches seven miles from the foot of Neahkahnie Mountain to the tip of Nehalem Spit. The beach is popular with windsurfers, who can often be seen riding the waves just offshore. If you want to get your heart pumping harder, you can jog along the beach, or pedestrian paths from the city to Nehalem Bay State Park , which offers tent, RV, and yurt camping, an amphitheater for summer entertainment, an airstrip, a horse camp, a boat launch, and walking/running trails. You can even rent a traditional bicycle, a beach ¨funcycle,¨ or surfing gear from Bahama Mama’s Bikes, Boards & Beach Fare . The Manzanita Visitors Center has FREE beach wheelchairs available that help to make Manzanita’s beach one of the most accessible beaches for everyone to enjoy. Manzanita also offers a private gym that allows drop-ins, and a stand up paddleboard company that offers lessons and guided tours. Slightly off the beaten path, located south of the city and next to Nehalem Bay State Park, is CARTM , a nonprofit organization operating a one-stop recycling center that accepts more than 40 types of materials, re-use thrift store, and transfer station. Check the schedule of another local nonprofit, the Hoffman Center , which is based in downtown Manzanita. It hosts artists, writers, and other creative types at readings, workshops, and other events. It also offers a clay studio that is open to the public. Play a round at the Manzanita Golf Course, which is open year-round. It features 9 holes, a pro shop, a snack bar and a nearby driving range. Manzanita´s annual events include the Manzanita Beach Walk & Run , Fourth of July Parade and Fireworks, Muttzanita (a celebration of all things canine), a holiday tree-lighting, and the New Year´s Day Polar Plunge. The Manzanita Farmers Market runs every year from June through September. Oswald West State Park is located a few miles north of Manzanita, off US Highway 101. In addition to a number of trails that wind through a temperate rain forest, the park offers access to Short Sands beach, a cove sheltered from wind. There are picnic tables scattered throughout the wooded property. The park also makes for a convenient starting point for hikes to Falcon Head and the Oregon Coast Trail . The longest river in the Coast Range, the Nehalem offers some of the best bird-watching around. It is also home, depending on the season, to fall Chinook, coho salmon, chum salmon, steelhead trout, and sea-run cutthroat trout, which is why it is nearly legendary among sports fishermen from throughout the Pacific Northwest. 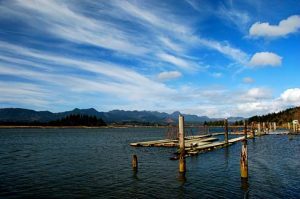 You can sit and watch the river roll by at one of downtown Nehalem´s public docks, or rent a kayak from Wheeler Marina and paddle around. Looking for a place to work out? Visit the North County Recreation District , which features a swimming pool, fitness facility with cardio equipment and weights, yoga classes, and other programs for all ages. 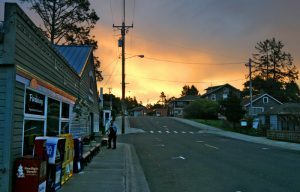 A short distance away, in the unincorporated community of Mohler, you will find the Nehalem Bay Winery , which is open for tasting most days. 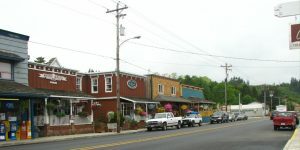 A few miles in the opposite direction is the unincorporated community of Bayside Gardens, which features a coin-operated laundry, Shell gas station and convenience store, a thrift store, tavern, restaurant and motel, a medical clinic, ambulance quarters, a fire district headquarters, and two churches. When the beach is too busy, you can always find respite in one of Wheeler´s city parks . The Waterfront Park is downtown, and, as its name implies, directly next to Nehalem Bay. Its gardens, picnic tables, benches, and barbecue grills make it easy to relax or even have a meal with a view of the estuary. A boat launch and public dock, located between the park and the bay, are popular with sports fishermen and kayakers. If you don’t have your own boat, fishing gear, or kayak, consider renting any of the above from Wheeler Marina , which shares the entrance from Highway 101 with the park and boat launch. Or head uphill to the Upper City Park , located on a hill overlooking the village. In addition to stellar views, the park offers playground equipment, picnic tables, a baseball diamond, and horseshoe pits. It´s a great spot for quiet reflection in the morning, and for large events with friends and family in the afternoons. Afternoons are perfect for shopping in downtown Wheeler, which offers antiques, gifts, art and crafts, office supplies and stationery, and a destination fabrics and quilting store. 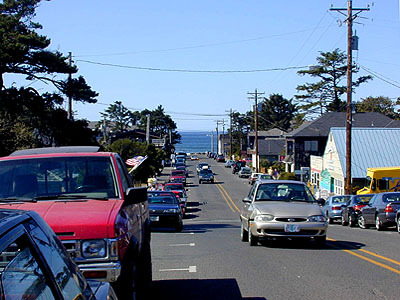 Outlying areas and attractions include the Nehalem Fish Hatchery , Nehalem Falls , Roy Creek Park and Lost Lake . The Old Wheeler Hotel and Wheeler on the Bay Lodge offers fine lodging accommodations.